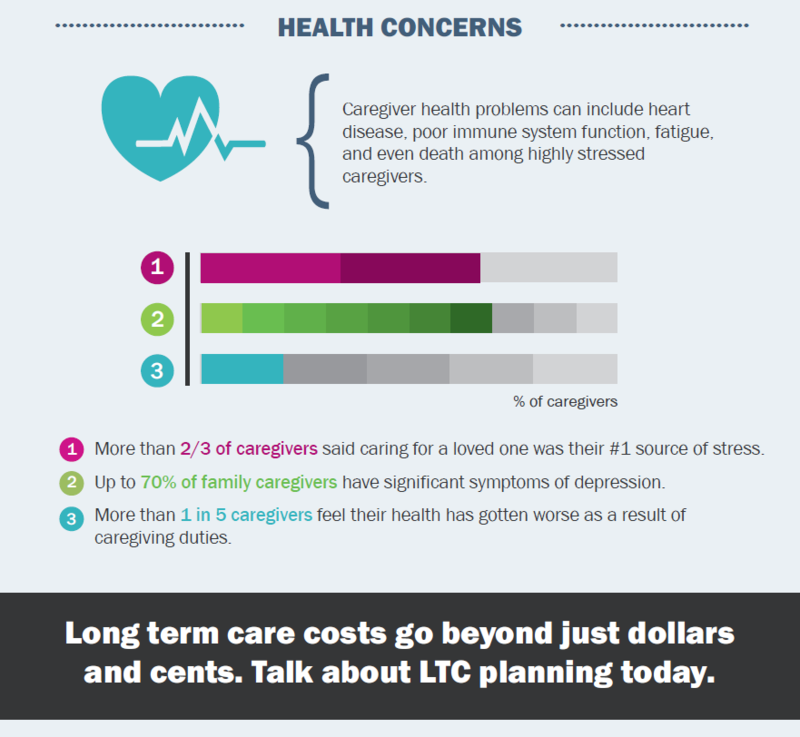 Understanding the need to plan for long-term care is important for everyone, especially women. Although many of us don't want to talk about it, the majority of us will have to confront a long-term care event at some point in our lives. This is especially true for women who comprise the majority of caregivers and recipients of long-term care. A lack of financial preparedness can compound the stress of care-giving and managing health issues. Unfortunately, statistics show women are less financially prepared than their male counterparts going into later years, and a Long-Term Care event can greatly exacerbate this fact. The following highlights facts and figures associated with this dilemma and offers some basic guidance to help you think about and plan for your future Long-Term Care needs. What does this mean for working women? Since caregivers are disproportionately women, who take more time away from work to care for others, their finances are also disproportionately impacted. 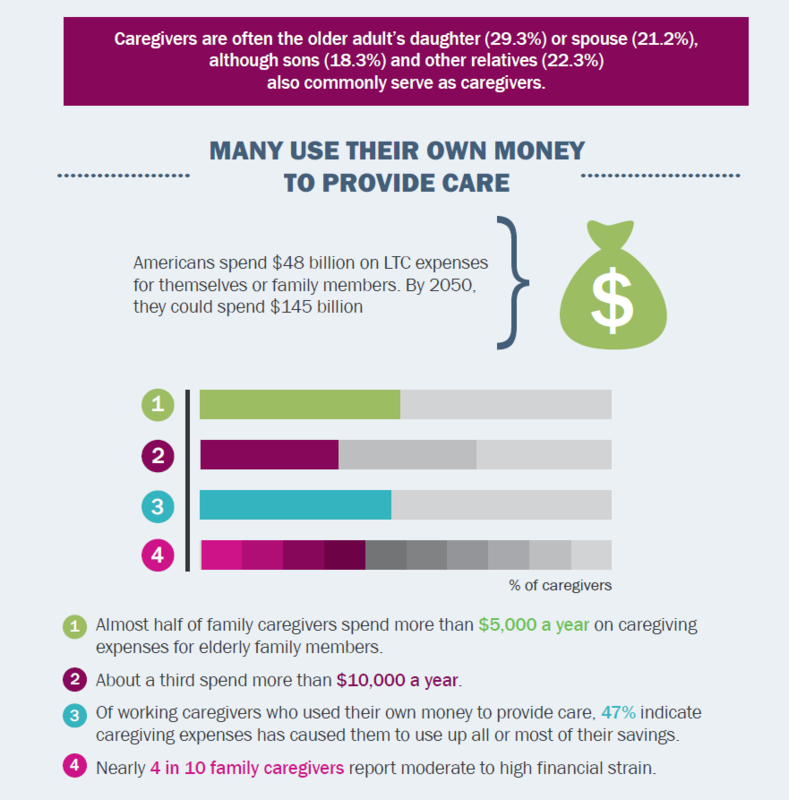 In addition to money spent out-of-pocket on caregiving, time away from work can reduce current income and contributions toward retirement savings. As the following facts and figures show, reduced work hours and/or fewer years in the workforce may add up to a significant loss in assets. In addition to providing care to an adult, women often simultaneously provide care for their children. 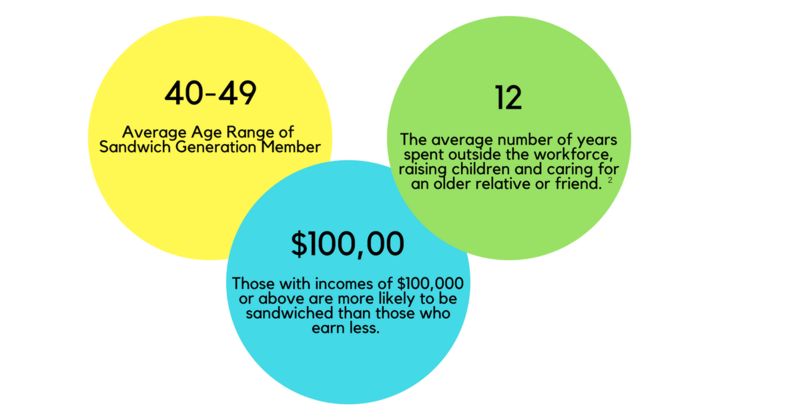 The term, The Sandwich Generation, was coined by Dorothy Miller, a social worker in the 1980's who noted the increasingly common phenomena of multigenerational care-giving. Couples who put off having children until their mid to late 30s also experience parents who live longer and develop more ongoing health issues. Increasingly, women are not only taking time off of work, but time away from parenting their own children; and as we will discuss below, postponing their own health needs. As you would expect, this predisposes caregivers to health problems of their own as a result of the physical and emotional stress of caregiving and failing to attend to their own needs. 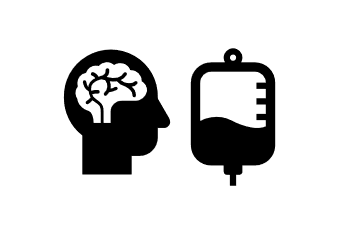 The stress of caregiving has been linked to health problems such as hypertension, 8 which may lead to greater health problems such as risk of stroke or dementia.9 Longevity in women is also associated with the onset of dementia. More than two-thirds of Americans age 85 or older, and eight out of 10 centenarians, are women. 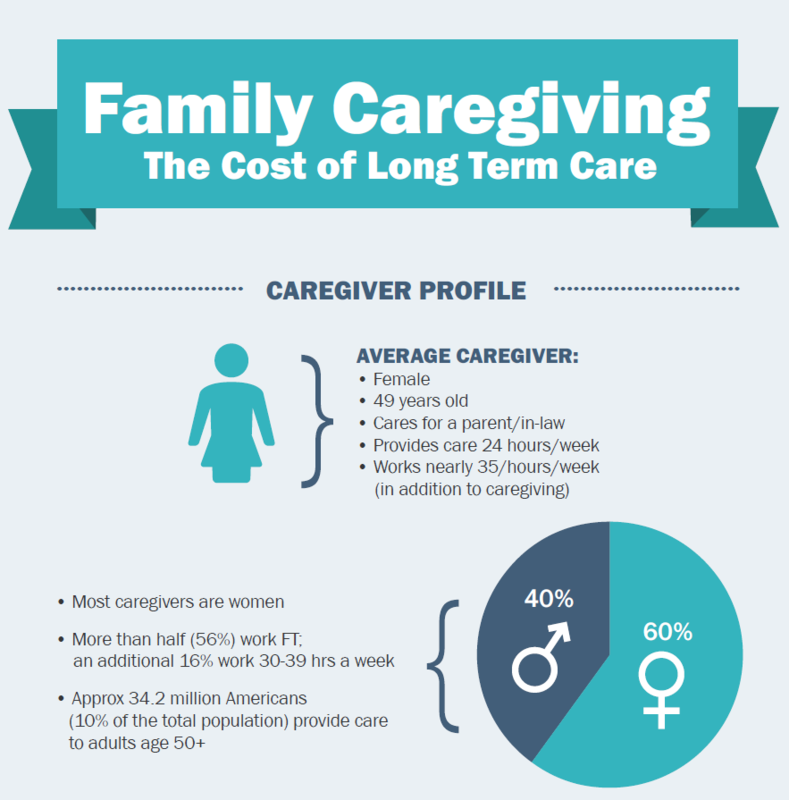 Longevity and stress of caregiving are just a few factors that play into women's need for long-term care over a greater period of time. As a caregiver, Your health and well-being may be at risk, but you can take steps to minimize the effects of physical demand and prolonged stress by putting yourself first. You can be a better caregiver, may reduce your need and expense for medical care, and potentially reduce the likelihood or extent of requiring caregiving from your loved ones. If you find it hard to make time for your well-being, consider the metaphor of putting the oxygen mask on yourself first. At the start of a flight, the attendant instructs all passengers to place the oxygen mask over their face before assisting others. Why? Because without enough oxygen due to loss of cabin pressure, you may pass out and become a burden, not a helper to others. Apply this same principle to your daily life. You are best equipped to help others, when you are rested, eat well, exercise, and in good health. So it is essential that you make time for your medical, physical, and emotional needs, especially when caring for others. What is the likelihood that you will be a caregiver? What support systems are in place or can you establish for yourself or others? If you are an only child, or the only sibling living close to your parents, is there a plan in place if your mother or father need care? Will you want to remain in your home as long as possible and receive care? Is your home suited to your physical needs? 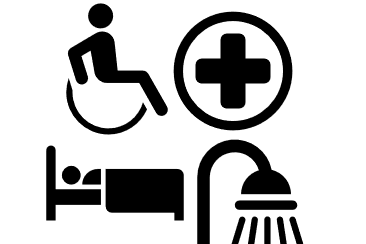 If you prefer to reside in assisted living or high level nursing care, is the facility near family? If something were to suddenly happen, would you prefer to remain close to your community to maintain friendships and the life you have built? Have you made these wishes clear to your loved ones? Have an open discussion with your spouse, your siblings, your parents, and your in-laws. Discuss the importance of establishing a long-term care plan, and encourage ongoing discussions as wishes and needs may change. As your advisor, we may be able to shed light on the various ways in which you can establish a plan for long-term care. Your physical, emotional, and financial health are inextricably linked. By discussing various planning tools such as insurance and estate planning, we can help you create a plan for the future and put you in a position to make informed decisions. As you contemplate and discuss your plans for long-term care, aging and retirement, a financial planner can provide an impartial perspective so that all family members are heard and considered. Don't delay. Contact us today to set up an appointment. 6 Caregiving and risk of coronary heart disease in U.S. women: A prospective study. 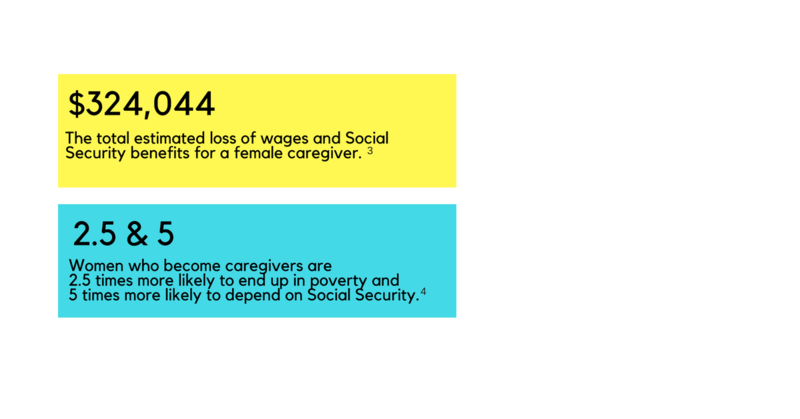 As cited in Family Caregiver Alliance, “Women and Caregiving: Facts and Figures,” FCA, https://www.caregiver.org/print/240, February 2015. 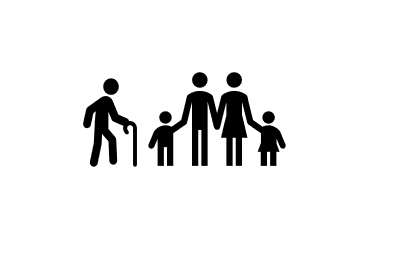 7 Reverberations of family illness as cited in Family Caregiver Alliance, “Women and Caregiving: Facts and Figures,” FCA, https://www.caregiver.org/print/240, February 2015.